I have been working non-stop the past few weeks. Not even "Snowmagedon" stopped me from working. I am not going to get into too may details, but work put me and my team up in a hotel a block from the client to make sure we would be able to make it to work during the blizzard. With all the work and staying in a hotel for three days I have not had much time to bake. Last night I wanted to get back into the kitchen, but I knew I wanted to make something fast and easy. 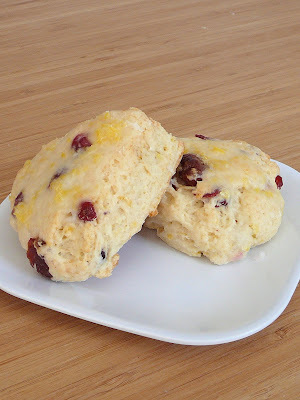 In comes these scones. They came together in minutes and only had to bake 10 minutes. I brought them in to work today and they were devoured. One of my co-workers said to me today "I hate you for making these." as he ate his third scone. Enjoy! Mix flour, sugar, baking powder, lemon zest, salt, and dried berries. Pour in heavy cream. Mix or knead by hand, just until combined. Mixture will be sticky. Flour surface. Divide dough into two sections and pat into two rounds, each approximately four inches. Using a pizza cutter, cut each round into 8 pieces and place on a greased large cookie sheet. Bake 9 to 11 minutes. Let cool five minutes, then glaze. 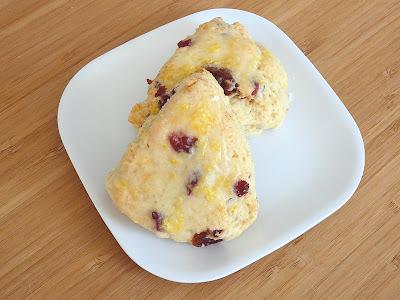 Mix together until a thin icing consistency; pour over warm scones.